It’s no secret…the moisturizing benefits of cucumbers used on skin around the eyes have become a reliable and effective way to hydrate and soften the delicate eye area. 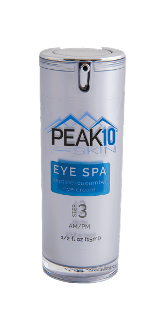 PEAK 10 SKIN’S EYE SPA peptide-cucumber eye cream uses a blend of Cucumber Extract, Peptides, Vitamin E and Retinyl Palmitate to provide generous skin nourishment and hydrating qualities that help alleviate dark circles, stimulate collagen growth, reduce wrinkles and fine lines and restore a healthier, energetic appearance to the eye area. The harmonious blend of nature (cucumber) and science (peptides) creates a luxurious, effective, cool cream for your eyes. Apply to ring finger and tap gently over the entire eye area. Good for sensitive and oily skin. Purified Water(Aqua), Cetearyl Alcohol, Squalane, Cyclopentasiloxane, Dimethicone, Hyaluronic Acid, Polysorbate 60, Soluble Collagen, Acetyl Hexapeptide-8, Sodium Ascorbyl Phosphate, Propylene Glycol, Glycerin, Cucumis Sativus (Cucumber) Fruit Extract, Retinyl Palmitate, Tocopheryl, Palmitoyl Oligopeptide, Palmitoyl Tetrapeptide-7, Butylene Glycol, Polysorbate-20, Acetyl Octapeptide-3, Phenoxyethanol, Ethylhexylglycerin, Melia Aazadirachta Leaf Extract.